Also serving communities of Rochester, Lincoln. There are 8 Assisted Living Facilities in the Springfield area, with 6 in Springfield and 2 nearby. The average cost of assisted living in Springfield is $3,564 per month. This is higher than the national median of $3,346. Cheaper nearby regions include Decatur with an average starting cost of $3,126. To help you with your search, browse the 21 reviews below for assisted living facilities in Springfield. On average, consumers rate assisted living in Springfield 4.6 out of 5 stars. Better rated regions include Chatham with an average rating of 4.8 out of 5 stars. The capital city of Illinois, Springfield is home to just under 115,000 people — 15 percent age 65 and over. Assisted living facilities in Illinois are known as "assisted living and shared housing establishments" and are regulated by the Illinois Department of Health. The Springfield area has 10 such facilities, with five in Springfield itself and another five in nearby cities such as Chatham and Decatur. July is the hottest month in Springfield, with an average high of 85 degrees and an average low of 63 degrees. January is the month with the most snow, with snow falling on an average of 5.4 days and a total of about 6.4 inches. Snow falls an average of 16.9 days during the entire year, for a total of about 20.9 inches. The overall cost of living in Springfield is 5 percent lower than the national average for the United States. The highest relative expenses are healthcare and transportation, which are respectively four and one percent above the national average. The lowest relative expenses are housing and utilities, which are respectively 20 and 11 percent below the national average. Springfield has a high crime rate, with only 4 percent of the cities in the United States having a higher crime rate. The annual rate of violent crime in Springfield is 11.5 per thousand people, compared to 4.36 for Illinois as a whole and 4.0 for the United States. The Sangamon Mass Transit District provides public transportation in Sangamon County, including Springfield. Seniors over the age of 65 and those with disabilities can ride any fixed-route bus for 60 cents, which is less than half the standard fare of $1.25. A reduced-fare ID requires proof of age or disability and a photo ID. The Springfield Ballet Company maintains a regular performance schedule in addition to special performances at senior centers and other community venues. The programs include a variety of dance styles such as contemporary and modern ballet. The Springfield Ballet Company also conducts educational programs, including residencies and workshops. The Springfield area is home to world-class medical facilities, including Memorial Medical Center, HSHS St. John’s Hospital and Vibra Hospital of Springfield, in the event of medical emergencies or illness. Assisted Living costs in Springfield start around $3,564 per month on average, while the nationwide average cost of assisted living is $4,000 per month, according to the latest figures from Genworth’s Cost of Care Survey. 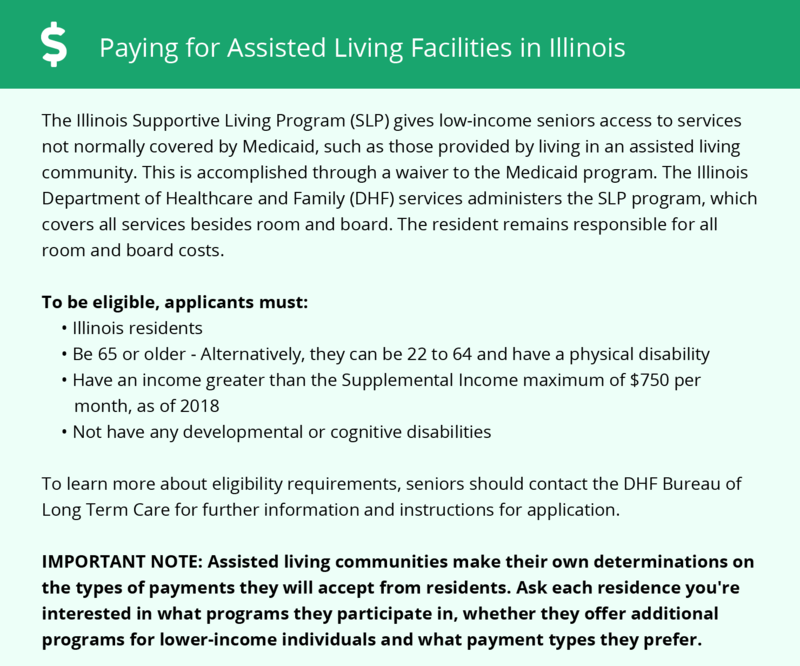 Illinois has nine waiver programs for community-based services, including assisted living. These programs are designed to meet a variety of specific needs. To see a list of free assisted living resources in Springfield, please visit our Assisted Living in Illinois page. Springfield-area assisted living communities must adhere to the comprehensive set of state laws and regulations that all assisted living communities in Illinois are required to follow. Visit our Assisted Living in Illinois page for more information about these laws.